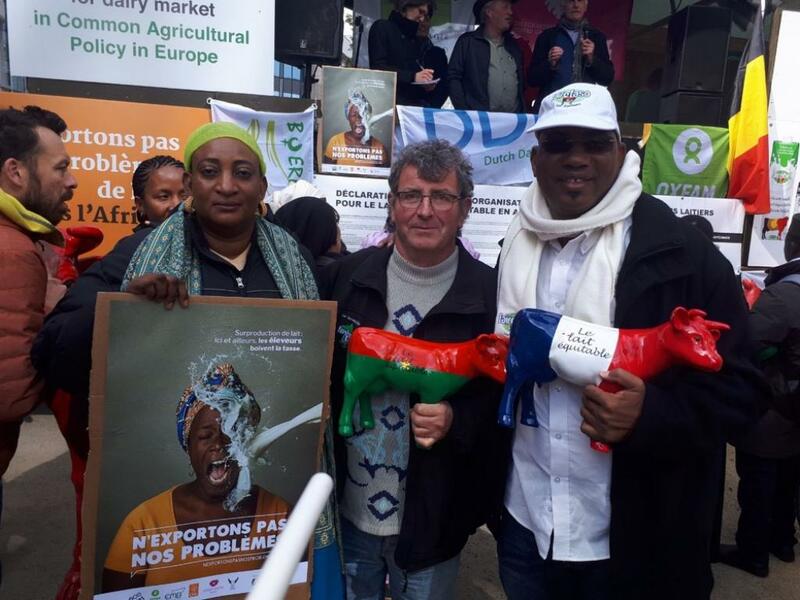 Dairy farmers from North Africa on April 10, 2019 protested outside the European Union (EU) headquarters in Brussels in Belgium against unabated export of dairy products to Africa. These farmers travelled thousands of kilometres to demand that the EU ensure that there is sustainable production of milk in European countries so they don’t obliterate the African dairy industry. The protesting farmers from countries like Burkina Faso, Mali, Niger, Algeria, etc, said since EU provides indirect subsidy to export dairy products, there is over-production of milk in European nations. The future doesn’t look much promising either. The EU Milk Market Observatory estimates that milk production will keep increasing for another decade. It projects that the production will increase to 176 million tonnes by 2026 from 163 million tonnes in 2017. “It is the unsustainable agriculture policy of the EU that encourages the idea of over production of milk, which is then exported to African countries,” said Jurgen Maier of Forum on Environment and Development, a Berlin-based non-profit that advocates for farmers’ rights and justified trade system. Moreover, the export share of this production has doubled in the last 12 years as it went from 6 per cent in 2007 to 12 per cent in 2019. This mainly includes cheese, butter and milk powder. Since the domestic demand is stagnant, the EU is increasingly turning to the global market to sell its produce. Since 2009, the EU has been flooding North African countries with cheap skimmed milk powder (SMP), which is then reconstituted into milk. This has allegedly destroyed the local dairy industries and the fresh milk collection market in Africa. “Thousands of families earn a living through milk production and processing. But as cheap imports from the Europe increase, their livelihoods will be more and more in danger,” said Christian Dovonou, country director of Veterinarians Without Borders in Burkina Faso. This re-fattening also makes the milk 12 times cheaper than the original milk fat, which is used to make butter. This finds EU a market among African companies that need fat-filled milk powder. The average price at which these firms have been importing the powder since 2016-18 is 58 per cent lower than the price of whole milk powder. Another threat is plant-based cheap milk, a dairy alternative that looks like milk. “The EU produces a lot of milk. To date, this problem has not been addressed at the source. Instead, promoting exports, especially of cheap products, is the solution they adopt,” said Thierry Kesteloot from Belgian development organisation Oxfam-Solidarité. The World Trade Organization (WTO) discourages any country to provide direct support or subsidy to export agricultural produces. But the EU has been indirectly providing subsidy, which encourages over production and causes domestic and international milk prices to collapse. The global dairy prices have crashed four times in the last 12 years. “The question is why do EU dairy companies do that when African dairy farmers can produce milk for their people,” said Maier. He added that African farmers lack facilities to transport their milk to urban areas, where people have better purchasing power. The companies in the EU nations utilise this opportunity and sell their produce. How Africa is being targeted? According to a Financial Times report, which quotes Kevin Bellamy, global dairy strategist at Rabobank, three times European companies invested in African dairy industry before the global milk crisis of 2015. But during and after the crisis there were 14 such dairy deals done. Africa has long been on EU radar’s for its dairy market owing to its rising population and income. Two multinationals — Danone and Arla Foods — earned in billions from Africa when the world was facing a price crisis. Arla foods expanded in Africa through two joint ventures in Sengal and Nigeria. French dairy giant Danone bought stake in Kenyan company Brookside Dairy, which further acquired the dairy industry in Uganda and Rwanda. Danone also bought majority stakes in Fan Milk, which operates in seven west African countries, and invested in Morocco. These companies understood the surplus situation in 2009 and they then got entered joint ventures and helped poor countries set up dairy companies around the globe. This way they made a space for themselves to be able to push different countries under the WTO or other free trade agreements to open the market. “The new free-trade agreements under WTO are not in force. The so-called economic partnership with African countries is helping these transnationals dump cheap produce in Africa,” said Maier. There are lopsided trade agreements like Lome and Cotonou agreements between EU and African-Carribean-Pacific (ACP) countries made in the name of boosting of economic development and integration into world economy. The Lome agreement of 1973 had not benefitted African countries and ceased to function in 2000. Then the Cotonou agreement came into force in 2000, under which the EU partnered with 79 countries from Africa, the Caribbean and the Pacific for regional cooperation. These agreements made African countries open up their market and compete with European market. “These trade agreements look fair on paper but not on ground,” said Maier. “There is no comparison between the big industrialised European countries and poor African countries, which mostly depend on subsistence farming,” he added. Milk industry lobbyist Eckhard Heuser claims that Africa is no more poor and does not need any protection. “We still live with a perception that black people are poor and they do not need quality dairy products. It is wrong,” said Heuser, chief executive, Association of the German Dairy Industry (MIV) in Berlin. Heuser even suggested that India, which has not opened its dairy market for foreign players, must learn from Africa to get benefits of quality products. “India should learn from other African countries and open the market. Indian people require quality dairy products like the Chinese, which the EU or German dairy industries can supply” he added. The EU’s policies have not just hurt Africa, but farmers in EU nations too. The number of dairy farmers has reduced by 80 per cent since 1983. From 1984 to 2015, the EU regulated its production through milk quotas. They were set at 10 per cent above European consumption to maintain exports and to put pressure on the prices that were paid to farmers. In 2003, it was decided to progressively deregulate the market with a gradual increase in quotas from 2008 onwards and their abolition in 2015, resulted into a massive rise in production. Today, despite stabilisation in production, milk prices remain insufficient to cover production costs for many farms in the European Union.